An event organised by Istituto Svizzero, Roma, based on a proposal by artist Nives Widauer. On the occasion of World Bee Day (20 May), the Istituto Svizzero is organising a two-day event that reaches out to the Roman public in order to have a discussion about the fragile coexistence of humans with bees. Day one comprises a multidisciplinary conference, which combines a distinctively scientific perspective with artistic expression. Contributions from different fields of study and research, including biology, ecology, history, literature, and art will not only point to the embeddedness of bees and honey in human thought and practice but also highlight the importance of pollinators for human livelihood. Along these lines, the second day invites interested people to an afternoon full of experiences with reference to the world of bees. 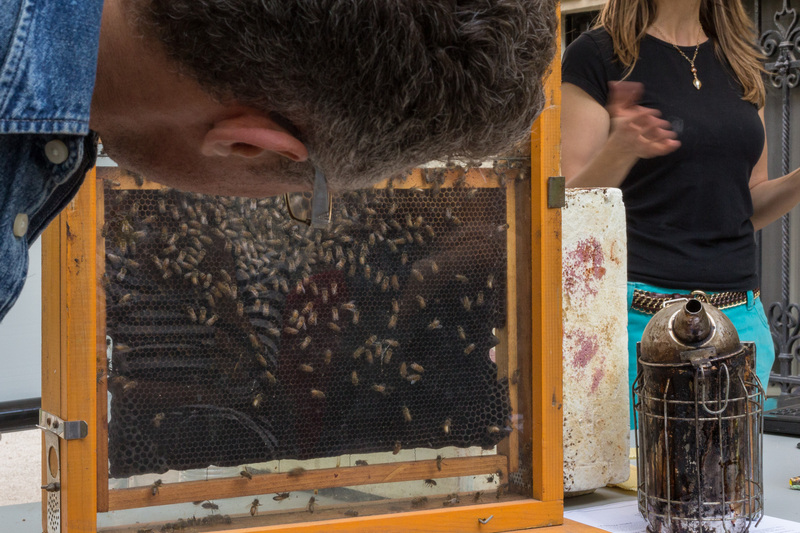 Beekeepers’ demonstrations, honey tasting, guided tours, movie screenings, and activities for children want to raise awareness of endangered species, while at the same time demonstrating the value of bees for our society. An event organised in collaboration with: University of Bern, University of Lausanne, University of Fribourg, Fondazione Edmund Mach (Trento), Food and Agriculture Organization of the United Nations, Technische Universität Dresden, Academy of Fine Arts, Vienna. Nives Widauer was born in 1965 in Basel, Switzerland. In 1990 she graduated from the Class for Audiovisual Arts at the School Of Design Basel. Parallel to the first exhibitions (video installations) she created video sets and movies. Various Art Awards, scholarships and exhibitions followed. Nives Widauer lives in Vienna. In her recent work the artist plays with the interface between analogue and digital and she expanded her medias to painting and sculpture. Her works have recently been shown amongst other places at Kunsthaus Zurich, Museum Belvedere Vienna, Kunsthistorisches Museum Vienna, Austrian Cultural Forum New York, SPSI Shanghai. Paolo Fontana was born in 1965 in Vicenza, Italy. In 1993 he obtained a degree in Agricultural Science and in 1998 the PhD in applied entomology. He worked as entomologist at the University of Padua until 2009. Subsequently, he was called by the Fondazione Edmund Mach (San Michele all’Adige,Trento) to establish a research group on bees and beekeeping, which was transferred into a permanent appointment in 2011. Principal fields of research are applied entomology, taxonomy and ecology of scale insects, taxonomy, biogeography, ecology and bioacoustics of the Orthoptera, apidology and beekeeping. Paolo Fontana conducted entomological expeditions in various countries in and beyond Europe and has described more than 80 new species of arthropods. He has published about 200 papers and is co-author of several monographs. Recently, he published a comprehensive book on honeybees, Il piacere delle api, concerning biological, historical as well as technical aspects. Damian Christinger (*1975, Zurich) studied Asian Art History and Intercultural Studies. He works as an independent curator, publicist and lectures at the University of the Arts Zurich on transcultural theory and practice, the Anthropocene and the cultures of food. His main focus is on the construction of “the other” in intercultural relations and art history. His last museum show at the Museum Rietberg featured Swiss artists questioning the relationship between the collection of antique non-European art and its local public. He was guest-curator for TBA21’s “The Current”, is co-editor of the publication „Happy Tropics 1“, and co-curated the exhibition „New Buenos Aires“ at Corner College. His latest essays appeared in Diaphanes, Swiss Future Magazine, the Swiss Museum Magazine, and in “Ernesto Neto and the Huni Kuin: Aru Kuxipa/Sacred Secret”. He was co-organizer of the conference „ArtScience Collab“ at Haus Konstruktiv, dealing with the difficulties of art-science collaborations in the Anthropocene. Nina Fahr was born in Schaffhausen, Switzerland. She holds a Master’s degree in literary studies, art history and media studies from the University of Constance in Germany. Since 2017 she is a PhD student at the University of Fribourg in Switzerland. In her current studies, she focuses on German literature in the medieval period, specifically on the tradition, form and function of prayer books. Her research is part of a larger project, which is funded by the Swiss National Science Foundation (SNF). Barbara Gemmill-Herren was Delivery Manager for the Major Area of Work on Ecosystem Services and Biodiversity at the UN Food and Agriculture Organization (FAO). She previously was Executive Director of Environment Liaison Centre International, an international environmental non-governmental organization based in Nairobi, Kenya. She helped establishing the African Pollinator Initiative, and was professor at the University of Nairobi, supervising post graduate students in pollination ecology. Within the FAO, she was the coordinator of the International Pollinator Initiative. In this capacity, she built and coordinated a global project on Pollination Services. She was also responsible for FAO’s work on Ecosystem Services in Agricultural Production, and was engaged in FAO’s new focus on Agroecology. Since leaving FAO, she has been a contributor to the UN initiative on “The Economics of Ecosystems and Biodiversity for Agriculture and Food” and has led the “Beacons of Hope” initiative of the Global Alliance for the Future of Food. Caterina Batello is currently Team Leader of the Ecosystem Management team of the Food and Agriculture Organization of the United Nations (FAO) Plant Production and Protection Division. She is an expert in grassland management and ecosystem services, including legume management for soil fertility enhancement, crop-livestock systems management to close soil fertility gap, climate change adaptation of agro-pastoral system including improved land and soil management practices, restoration of degraded vegetation, and sylvo-agro-pastoral practices and is Agroecology Focal Point for the FAO. Jürgen Müller holds the chair of early modern art at the TU Dresden. His field of interest concerns the northern Renaissance. He has extensively published on Hans Holbein, Albrecht Dürer and Pieter Bruegel. His latest book on Rembrandt’s „Nightwatch“ has come out with Brill publishers in 2015. Elisabeth Priedl is senior researcher at the Institute of Art Theory and Cultural Studies of the Academy of Fine Arts Vienna. She studied Art History, Archaeology and Philosophy at the Universities of Vienna, Graz (Austria) and the Università degli Studi Roma Tre. Between 1996 and 2000 she was a pre-doctoral research scholar at the Bibliotheca Hertziana in Rome (Max-Planck-Institute of Art History, Rome, Italy). In 2004 she completed her doctoral dissertation about the pictorial decoration of the Roman church of Santa Susanna (“The Two Susannas of the Cardinal Rusticucci. On the Didactic Program of the Depicted Decoration of the Church Santa Susanna in Rome”). Her main research areas concern the early modern period, especially Italian art and art theory as well as gender and queer theory. Elisabeth Priedl has published widely in those fields and on contemporary art. Laurent Keller (born in 1961) is professor of evolutionary biology and head of the Department of Ecology and Evolution at the University of Lausanne. He uses ants as a model organism to study the principles governing the origin and evolution of animal societies. He is particularly interested in how interactions between genetic and social factors jointly influence individual behaviour and social organisation. He is a member of the Swiss National Scientific Council. He has written >300 scientific articles and a popular book on ants. He has been awarded several prizes, including the Latsis national prize, the EO Wilson Naturalist award and the Marcel Benoist Prize. Lars Straub completed a BSc-degree in Biology and Chemistry in 2012 at the Humboldt University of Berlin, Germany. Subsequently, he moved back to Switzerland to complete a MSc-degree in Ecology and Evolution at the University of Bern, Switzerland. Later, in August 2014, he joined the Institute of Bee Health at the University of Bern where he completed a PhD in Biomedical Sciences. Since August 2017 he is a post-doc researcher at the Institute of Bee Health. His main research interests involve studying the impacts of neonicotinoid pesticides and parasites on bee health. (Associazione Laziale Produttori Apistici) In this workshop the public will have the opportunity to observe and discover an extremely efficient and far-sighted superorganism in which the single bees live in function of the community. Each of them carries out, according to its age and the specific family needs, precise tasks that allow the complex organism to feed, protect and reproduce itself. At first glance the only prima donna is the queen bee, once you look closer also the tens of thousands of simple worker bees establish, from time to time, the needs to be supported, like in a perfect democracy. Indifferent to fatigue, the bees carry out simple and complex tasks with skill and method. Despite the amount of monoflora honeys produced in Italy and the consequent different ranges of honeys with different organoleptic characteristics, it is still necessary to talk more about it at a national level. Paradoxically, per capita consumption of honey is just over 400g / year. As Dr. Lucia Piana says: “Honey tasting is essentially a practical discipline, in which experience is of utmost importance”. The proposed sensory analysis will then be used as an approach to honey tasting to enhance its characteristics and to draw individual experiences from the varieties and qualities of different monoflora honeys typical of the Roman countryside. The workshop will be able to provide answers to what our palate perceives and recognises. While walking the streets of architectural baroque style Rome we will discover the heraldic Bees, symbol of the Barberini family. Starting from Fontana delle Api in via Veneto, the itinerary will then take us to Piazza Barberini, decorated by the Fontana del Tritone —work of Gian Lorenzo Bernini—to then linger in the courtyard of Palazzo Barberini. The visit will continue on Via di Propaganda where you can admire the homonymous palace that compares the work of two great protagonists of the Roman Baroque: Bernini and Borromini. The tour will end at Fontana della Barcaccia in Piazza di Spagna.